Along the way, Roosevelt and his men faced an unbelievable series of hardships, losing their canoes and supplies to punishing whitewater rapids, and enduring starvation, Indian attack, disease, drowning, and a murder within their own ranks. Three men died, and Roosevelt was brought to the brink of suicide. 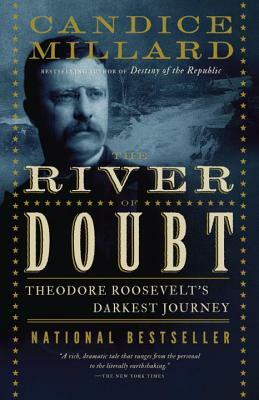 The River of Doubt brings alive these extraordinary events in a powerful nonfiction narrative thriller that happens to feature one of the most famous Americans who ever lived. From the soaring beauty of the Amazon rain forest to the darkest night of Theodore Roosevelt’s life, here is Candice Millard’s dazzling debut. CANDICE MILLARD is a former writer and editor at National Geographic magazine and New York Times bestselling author. She lives in Kansas City.